Experience one of the most unique rail journeys in Australia steeped firmly in Australian Pioneer history. Rising from sea level to 328m, the journey to Kuranda winds its way through World Heritage protected tropical rainforest, past beautiful and spectacular waterfalls and into the awesome Barron Gorge. Only minutes away from Barron Falls the train journey comes to an end at beautiful Kuranda Station. 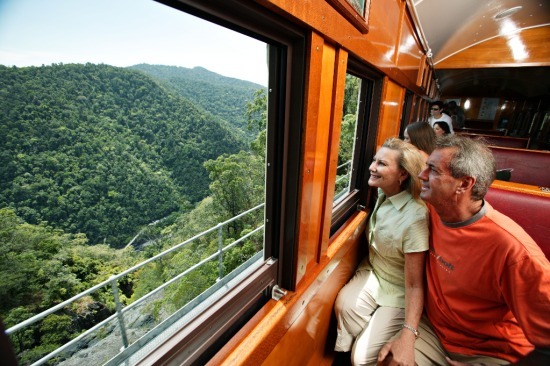 The Kuranda Scenic Rail journey takes one and a half hours to complete and includes an English commentary on the history of the region and the railway. All passengers receive a a souvenir booklet which includes information on the history of the railways construction, a trip map and a map of Kuranda. The Kuranda Scenic Railway can be joined at Cairns Railway Station or Freshwater Connection for morning departures to Kuranda. Journeys from Kuranda Station to Cairns run in the afternoon. Each carriage is fitted with three media screens to provide passengers with detailed information of the history of the Kuranda railway. There are also two gold class carriages where refreshments and finger food are served on the journey. The dreamtime story of Buda-dji, the ancestral being, is also told daily. Buda-dji is the Carpet Snake who, in the dreamtime, carved out the Barron River and the creeks that join onto it, from the coast to the Tablelands. The Railway Engine itself has been painted with a representation of this ancestral being. 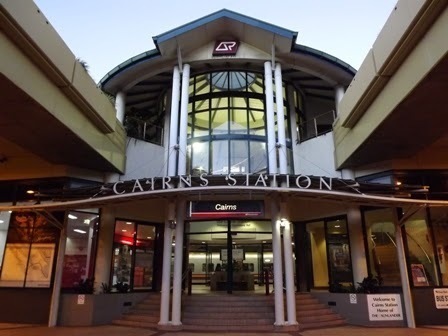 Cairns Central Railway Station is centrally located in the City, adjacent to the Cairns Central Shopping Centre, and within easy walking distance of most city accommodations. The station is home to the Kuranda Scenic Railway, The Sunlander and numerous other scenic rail services such as the Savannahlander. Freshwater Connection is a popular departure point for pre-organised tours. 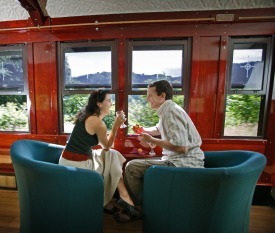 Situated in a quiet, leafy suburb, amidst tropical gardens and authentic heritage railway carriages Freshwater Connection provides a perfect venue for visitors to enjoy a hearty breakfast and is an ideal way to begin a Kuranda Scenic Railway journey. Many of Freshwater’s small Queenslander houses were built for railway workers and local farmers in the 1920 & 30s, some with timber from the old Mareeba Hospital. The very large mango trees in the area date from the 1890s. Freshwater Connection was built in 1984 as a tribute to the visionaries and pioneers who built the Kuranda Scenic Railway between 1887 and 1891. Freshwater Connection station includes a museum, and pioneer cottage which provide visitors with an interesting and educational experience. 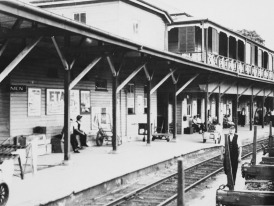 Kuranda Station is one of the earliest stations to be built in Australia using standard concrete units and is the oldest remaining examples of its type in Queensland. Described as “after the style of a Swiss Chalet, the idea being to make Kuranda a show station”, the station was designed in 1910. A modified version of the design was built in 1914 and included the Passenger Station building, Signal Cabin and Utilities Block. Ornamental planting proposed in the 1910 scheme, was developed by George Wriede and Bert Wickham, both station masters at Kuranda. 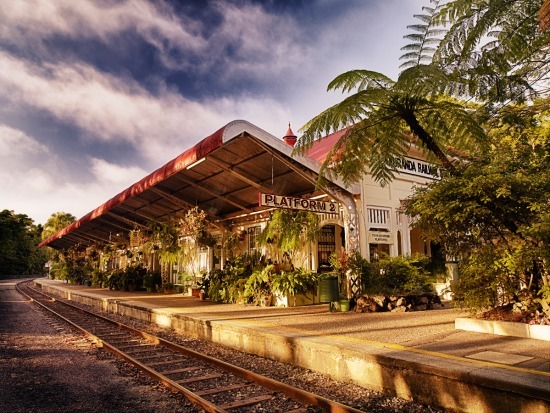 Today Kuranda Station is world renowned for its tropical gardens and historic significance. 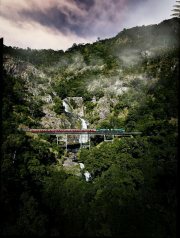 It is possibly one of the most photographed railway stations in the world. The heritage-listed buildings blend with the tropical surrounds providing a relaxed environment to enjoy. 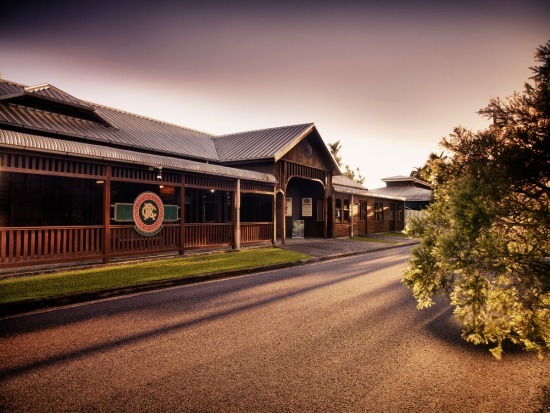 The Kuranda Railway Tea Rooms at the station offer a great range of souvenirs and refreshments. It was in 1882 that the miners of Herberton were on the brink of total starvation, unable to get supplies due to flooding. A route to civilisation was desperately needed for the purpose of meeting ships at the port, to deliver goods to the city and towns to the west, and more importantly to bring back the spoils of the hinterland particularly tin, timber, small amounts of gold and subsequently sugar, tobacco, copper and lead. Adventure bushman and colourful pioneer, Christie Palmerston, was charged with finding a starting point for a railway. 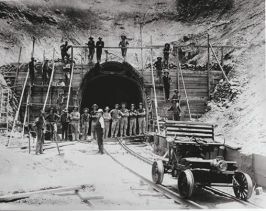 The Premier Sir Samuel Griffiths turned the first sod for the line which was to be built in three stages. Men tackled the jungle and mountains not with bulldozers, jackhammers and other modern equipment, but with strategy, fortitude, hand tools, dynamite, buckets and bare hands. Great escarpments were removed from the mountains above the line and every loose rock and overhanging tree had to be removed by hand. After removing 2.3 million metres of earthworks, creating 15 tunnels, 93 curves, dozens of bridges and 75 kilometres of track, a banquet high up on the bridge with General Sir Henry Wiley Norman, Governer of Queensland marked the completion of Stoney Creek Bridge. On June 15th 1891, Mr Johnstone, one of three Railway Commissioners at that time opened the line for goods traffic only. 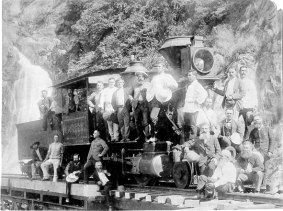 Just ten days later, the Cairns- Kuranda Railway line was opened to passenger travel. 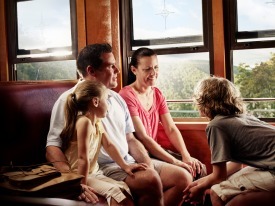 The original Kuranda Scenic Railway is truly a legendary demonstration of man’s ingenuity and nature’s wonder. 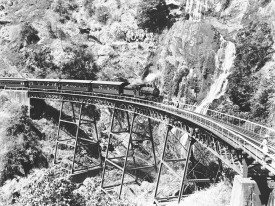 The 34km Kuranda Scenic Railway was, and still is considered a remarkable engineering feat of tremendous magnitude. 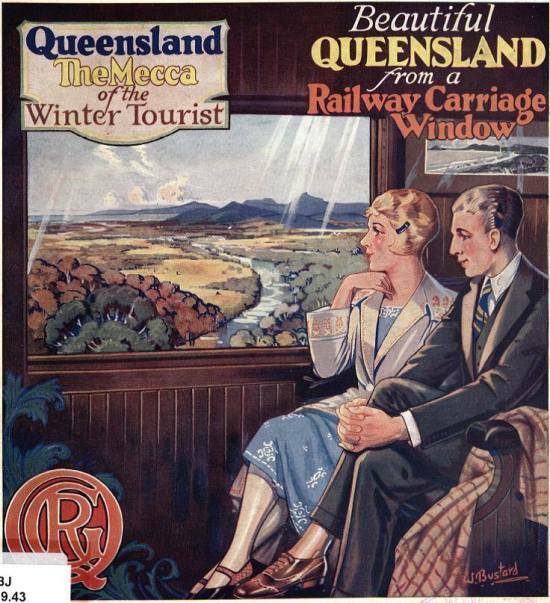 1926 poster promoting Queensland Tourism and featuring the Kuranda Scenic Rail. The window displays a view of the Baron River and Cairns. *Gold Class is only available on the 9:55am departure from Freshwater Station and the 3:30pm departure from Kuranda Station. The original Kuranda Scenic Railway Heritage carriages offer the old world charm of travelling in authentic timber carriages some of which are up to 90 years old. - Seated in our refurbished Heritage carriages. - Chilled refresher towel during the summer season. - Water cooler at the end of each carriage. Royale class suitable for large groups with a mid range budget (minimum 15 customers). Your group will travel in our refurbished Heritage carriage with refreshment service enroute served by an exclusive hostess. - Served by our host/ess. - Australian sparkling wine, orange juice, locally grown macadamia nuts, souvenir postcard & badge. Gold Class provides a premium experience for customers wanting that extra comfort, a little bit of luxury, and a the most memorable experience. - Individual seating, lounge-style chairs. - Ambient, historical décor, including timber look flooring, historical photographs and cedar interior. - Quality refreshments including sparkling Australian wine*, beer*, orange juice, soft drink, ice water, mocktails, tea, coffee and appetisers and a chilled refresher towel during the journey. - Kuranda Scenic Railway gift pack including Kuranda Scenic Railway badge, pen & postcard. Queensland Rail Travel have developed a unique and interactive app to give passengers the opportunity to listen to commentary while they sit back, relax and take in the many historical sites onboard the Kuranda Scenic Railway. Once installed on your Apple or Android device, the app allows you to browse at your own pace whilst you travel onboard the Kuranda Scenic Railway, and find out more about the World Heritage protected rainforest landmarks from Cairns to Kuranda. It is recommended to download the app prior to your arrival in Cairns, and remember to bring earphones for when in use onboard the train. The KSR app is available to download for free. A limited number of wheelchairs/mobility scooters can be transported on each Kuranda Scenic Railway service in the PWD carriage. Loading area 6 has a ramp to the train platform. 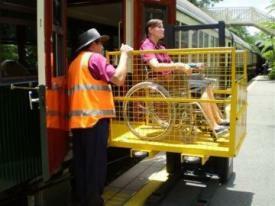 a safety cage and hand forklift allow wheelchairs on the train. Car 6 is accessible features an accessible bathroom. There is no access for wheelchairs/mobility scooters to disembark at Barron Falls station. When booking please advise Reservations you require wheelchair access, so that the appropriate assistance can be provided. A courtesy shuttle bus from the Skyrail/Railway stations to carry visitors to the markets. This runs every 15 minutes until 2.40pm. A disabled toilet is situated in the main public convenience complex in Kuranda Village. Collapsible prams and strollers can be stored under the Heritage Class seats provided they are no more than 25cm in height once collapsed. A limited number of non-collapsible or large collapsible prams and strollers may be accepted on a Kuranda Scenic Railway service. They can be stored in the PWD carriage wheelchair spaces if they aren’t being used for wheelchairs, in the guards van or in the luggage storage section on each service. The acceptance of larger prams and strollers on each Kuranda Scenic Railway service is at the discretion of the onboard staff and subject to available space on the day. For safety reasons, children are not allowed to travel on the train in a stroller or pram.